If UFC featherweight champ Max Holloway or undefeated challenger Brian Ortega isn’t able to make it to the cage for their anticipated UFC 231 main event title fight, Renato Moicano will be called up to step in and replace the absent fighter. The streaking Brazilian featherweight contender will fly to Toronto, the card’s host city, and weigh-in as an understudy, according to ESPN. Moicano was originally expected to battle Mirsad Bektic on this anticipated card, but unfortunately, this bout was nixed when Bektic sustained an injury. Though the promotion apparently sought a replacement opponent for him, they ultimately decided to simply fly him into Toronto as an understudy. This is a practice the promotion has adopted recently, most notably when Alexander Volkov was pegged as an alternate for Daniel Cormier and Stipe Miocic’s UFC 226 title fight, and when Kamaru Usman was named the understudy for Tyron Woodley and Darren Till’s UFC 227 title fight. News of Renato Moicano being named an alternate from the UFC 231 is welcome, given the trouble that has plagued Max Holloway’s recent career. The featherweight champion has been scheduled to fight three times in 2018 — against Frankie Edgar, Khabib Nurmagomedov and Ortega — but has unfortunately not made it to the cage for any of these matchups due to various issues. That being said, Holloway has been adamant that he will show up to fight Brian Ortega at UFC 231. UFC 231 goes down on December 8, inside Toronto’s Scotiabank Arena. The card will be co-headlined by a women’s flyweight title fight between Valentina Shevchenko and Joanna Jedrzejczyk. Other highlights of the bill include a strawweight fight between Claudia Gadelha and Nina Ansaroff, and a light heavyweight bout between Jimi Manuwa and Thiago Santos. 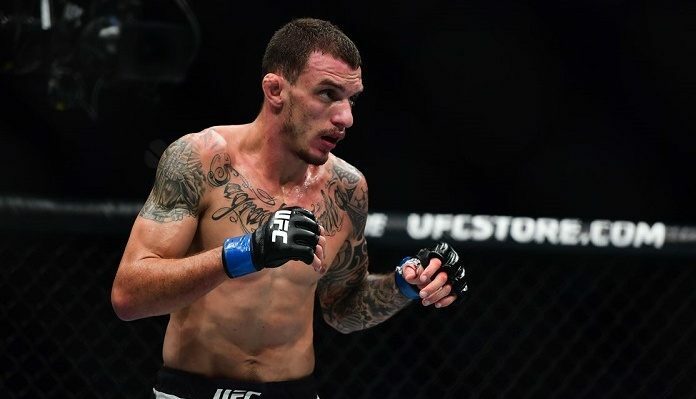 Do you think Renato Moicano will be called upon, or will the UFC 231 main event go ahead as planned?